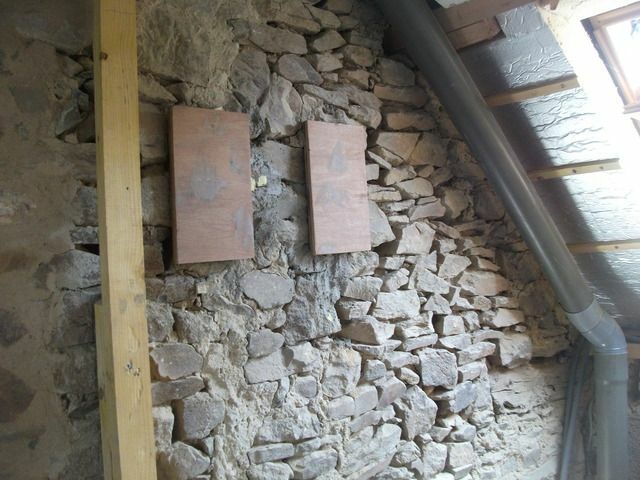 The New Old School Bog and Cistern | MY RUSTIC VIEW. The subject of toilet seat up or down has never been an issue between MrsB and myself and we both consider the conventional bog lid to be a rather pointless exercise. It is almost a denial of the fact that you have a toilet, or loo, or bog, yet alone have to see the bowl, which will briefly contain your bodily waste before it makes its journey to your favourite beach or river. Most people just want to flush it away and have someone else deal with it, a sort of “dump and forget” policy. This is all fine and dandy if you live in some swanky modern metropolis that has a mains sewer system, however once you live in a house that has its own septic tank and the performance of that tank, along with its associated pipework, is determined by what gets flushed into it, one tends to take more of an interest in the whole system and what happens to ones poo and pee once flushed down the pan of a septic tank connected toilet. It is a fascinating process however I wont go into detail now, in fact I am unsure how I sidetracked myself into talking about the destination as opposed to the drop off point, which is the main purpose of this post. I have never liked a bathroom where there is a bog in it, it shows a remarkable lack of forethought for the convenience of all concerned, however since profit became many peoples fundamental motive in housing, instead of a decent “home” and “space” to live in, the rooms became smaller and the space became squeezed until, in some houses, the person taking a leisurely bath is rudely interrupted by someone needing to have a dump, or the person who has “Tommy Turtle Head nearly touching cloth” is forced into the half crouched, clenched buttock dance outside the bathroom door accompanied by the ever increasing plaintive pleas of “I really have to go, let me in” so familiar to all who have ever been in urgent requirement of emptying their bowels. 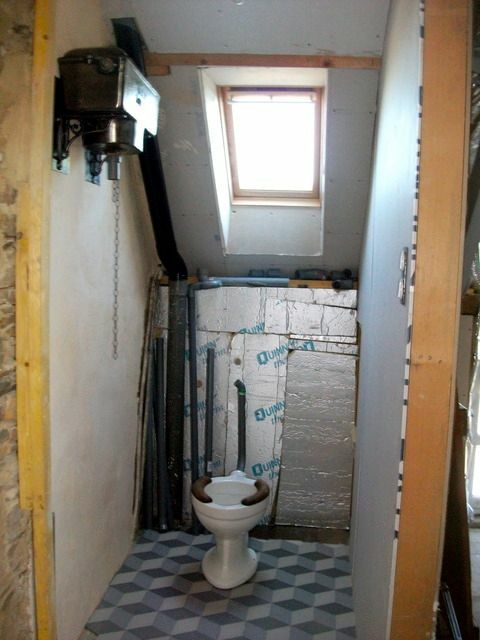 The solution is obvious, have the bog in a separate room. A room of its own. 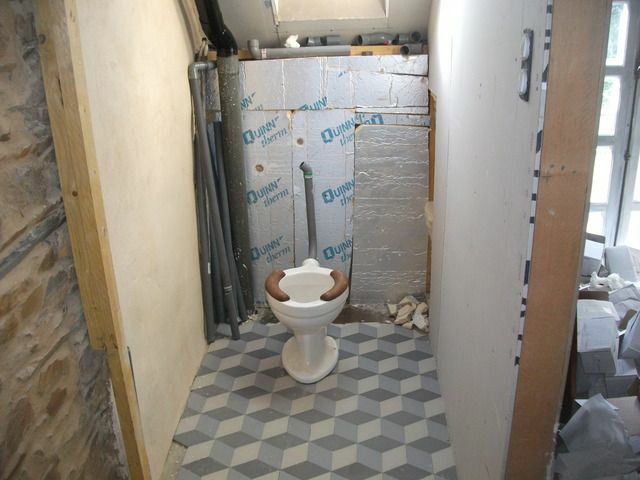 We designed, into the space available, a separate bog for upstairs and were looking for a suitable pan. 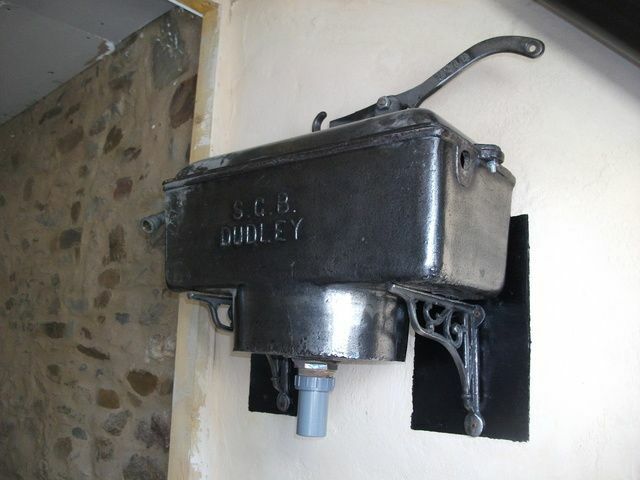 We visited a friend’s barn conversion in Wales and they have this delightful old pan (self cleaning due to the turbo flush motion) that required no seat, but we found that it could be a bit chilly on frosty morning. However the seed was planted and a few months later we had a “eurika moment” when we remembered the school bogs from the days gone by, that had two semi circles of wood as a seat so you never had that cold arse feeling on a winter’s day. Our search eventually ended up with an on line reclamation place called “mongers” (http://www.mongersofhingham.co.uk/) absolutely superb and an extremely useful website and helpful crew. There in the gallery was exactly what we wanted but with the added bonus that they also had sand blasted and polished, cast iron, chain pull, cisterns. Whoop whoop!! 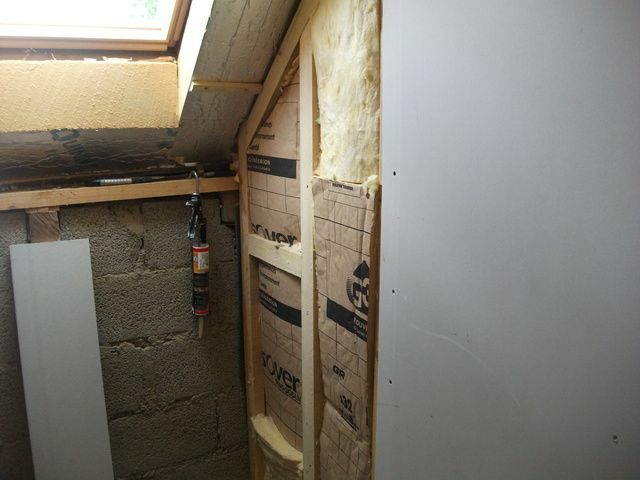 First of all had to finish the plaster-boarding of the side wall and ceiling, fit the insulation on the front wall and affix the wooden plates for the main brackets. 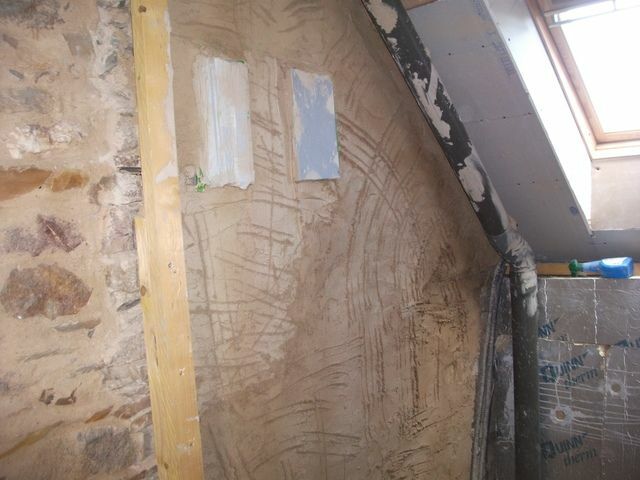 Then get on the scratch coat and followed by the top coat of lime and mud render. After the wall was painted and the bracket wood glossed black it was case of fitting the brackets and the cistern (not yet plumbed in and the down pipe will be brass when finished) to get the largest “drop” possible for the water. 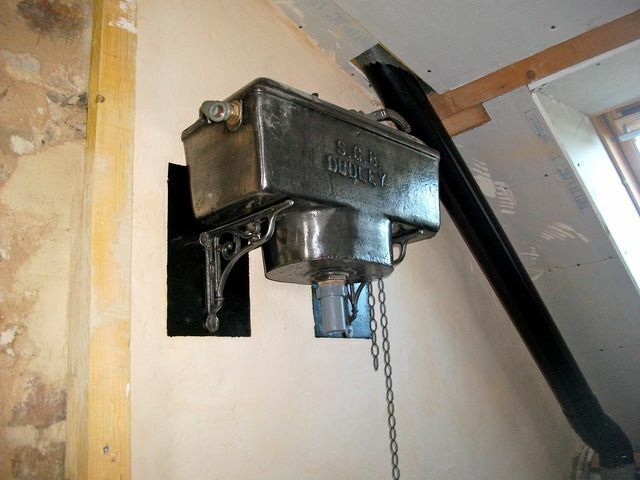 and a bit more detail shot of the pan and cistern with heavy duty chain attached. 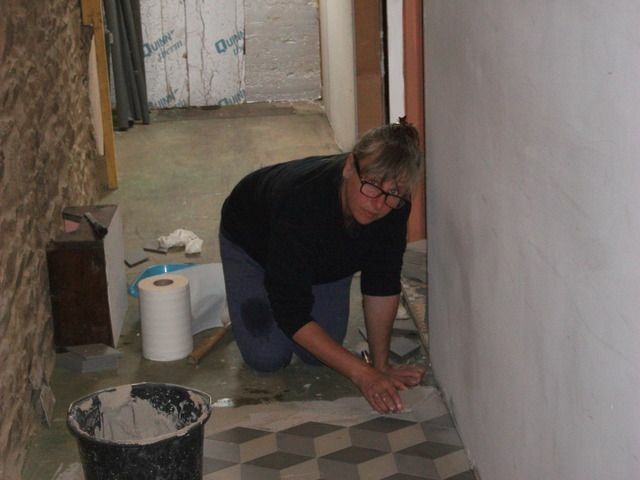 So apart form a bit of fancy cutting work for the wobbly wall side tiles, the door to be fitted and bit of plumbing for the bog, we are nearly there on the upstairs bathing and ablution front. 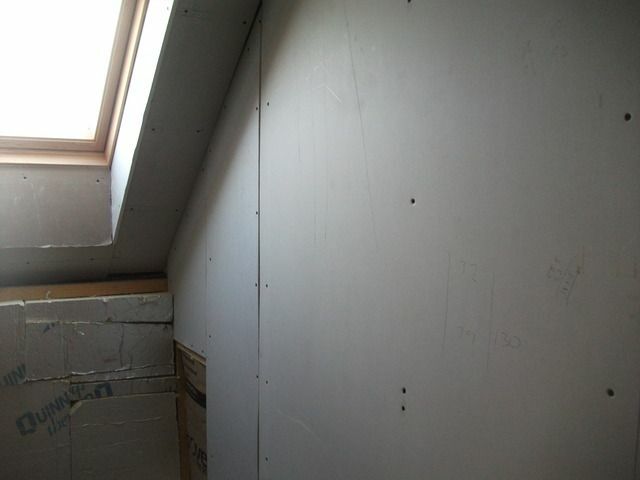 This entry was posted in all posts, Billy&Gentley Dreambuilders by bentley. Bookmark the permalink. I’m pleased to see that Mrs. B has a much more responsible approach to PPE than your carefree daughter! But seriously, i love this latest batch of updates – i started reading yesterday, and returned to finish it off today, only to find the added bonus of the crapper! Marvellous! Aye Aye Matt, I was more concerned about the amount of paint she was splashing about and wondered if she was going to roller her arms and face once she had finished cutting them in. Great to have them ever keen to get stuck in and make their mark. It is coming along nicely now. Love it – great work. Like the fact it’s different from the norm. 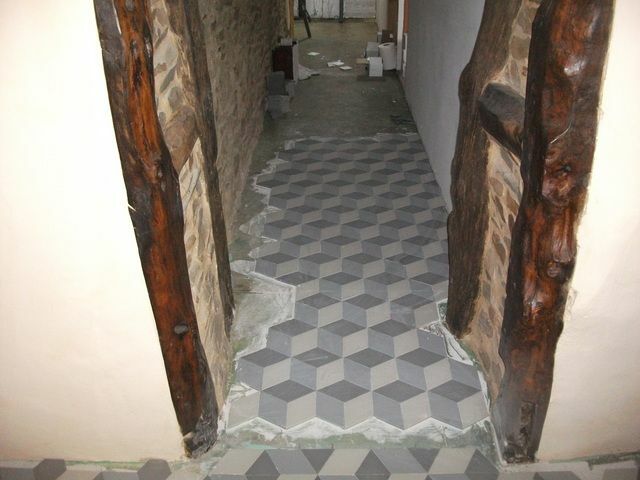 Not so sure about the 3D effect tiling but good work. Aye Aye Jack, Thanks for your positive vibes. We are really pleased with the overall effect so far and it is proving to be a very enjoyable and practical space to live in. 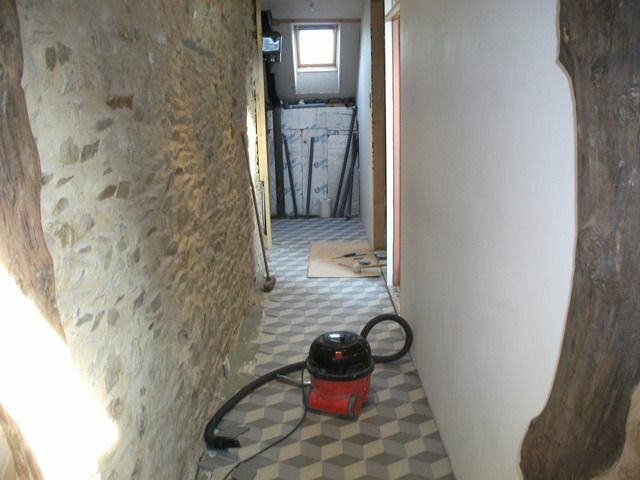 Plenty still to do in way of finishing touches with master bedroom back2front room (lounge) and the scullery still to receive the treatment. 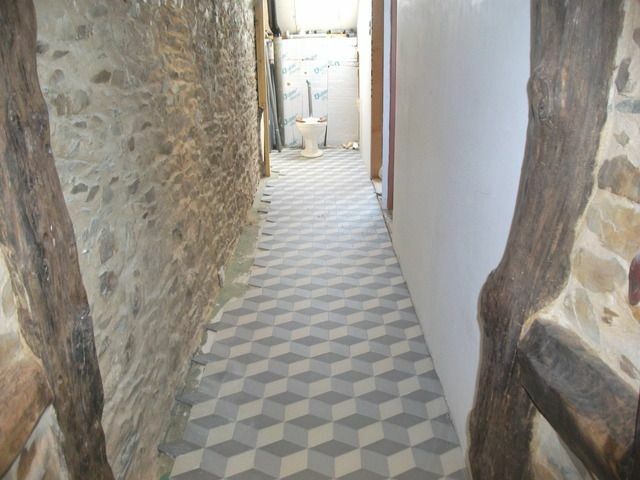 Its is funny with the 3D tiles as form the photos people are often unsure as to how it is to walk on but the reality is that every time you look at them the pattern changes. The photos don’t really do them justice however they will blend in better as time moves on.